As if the price hadn't given it away, Asus' Republic of Gamers Xonar Phoebus is a very high end soundcard. So ridiculously overspecced, in fact, that it requires a six pin molex power connector to work, like a graphics card. It's neatly presented behind a metal EMI shield and comes with a volume control dongle that extends the headpone and mic sockets to the desktop too. The best thing about it, though? It has coloured lights behind the 3.5mm jacks on both the card and breakout dongle so you can see which port is which without struggling to decipher small icons. The Asus Xonar Phoebus isn't just about looks, though. It has a built in headphone amp and a quick peak under the EMI shield suggests every component is as good as you get. Even if that is the case, however, this much for a sound card that doesn't even support for 1/4inch jacks has us preparing the laughter cannon. The various chips on board the Xonar Pheobus are virtually identical to the ones on Asus' previous flagship, the Asus Xonar Xense. There's a bit of confusion as to whether or not the CM888HDT processor is capable of 96KHz or 192KHz sampling (Asus lists both, we suspect it's the latter) but the truth is it doesn't matter. The high quality digital-audio converters and powerful TI6120A2*1 headphone amp are what's important here, and they're the same as the ones on the Xense. Quite why the Phoebus needs the extra power line isn't clear, but it can't hurt in terms of reducing interference from the PCI Express bus. While we prepared words which would ridicule the Xonar Phoebus for being an overpriced cash in on so called 'audiophiles' lack of financial nous, we're now prepared to hear those same sentences played back endlessly in a repeating loop of crystal clear quality for the rest of eternity. Preferably read by Derek Jacob over the sound of hollow laughter. This is, possibly, the best sound card out there at the moment. A word of warning, though. Some owners have reported driver problems leading to in-game instability, and while we didn't experience that, there were a few problems with missing options in the driver control panel and odd distortion from the preset 'music' set-up. Fortunately, the secondary control panel, supplied by Dolby, is much better and more stable. But the audio? Amazing, in a word. Plug in a set of headphones and it's as close to listening through a high quality external amp as you get. Music is warm, rich and precise while retain an astonishing range that will reveal sounds in familiar songs you've never heard before. That's not all: games from Diablo III to Battlefield 3 are simply better for its presence. Not only is sound clear, wide and with astonishing range, surround effects have a precision and clarity that will appeal to pro gamers looking for that extra edge. So despite our misgiving, an excellent card indeed. Is it, however, worth the price? Of course not. 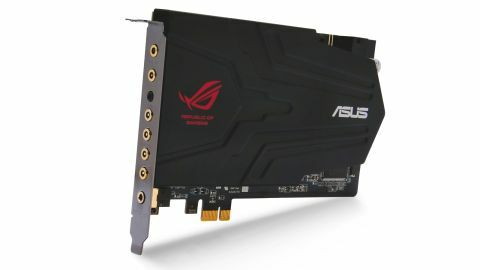 An Asus Xonar Essence STX, for example, is nearly as good for about £60 less, with almost all of the same features barring the external sound – and there's plenty of almost as good again cards for less than £100. What's more, if you haven't got a decent set of headphones, you're far better off spending this sort of money on them instead. For all that our wallets dislike the Phoebus, though, having used it now it's going to be very hard to go back. ASUS' Xonar series continues to set the standard for add-in sound cards, and its familiar line up of audio processors, DACs and op amps always impresses. The Phoebus really is the best of the lot, though, and makes games sound incredible. The drawback is, of course, the price. This kind of quality doesn't come cheap and while it is audibly better than its rivals, unless you're dead set on having the best and have the speakers and cans to back it up, you really don't need it. In danger of drawing us into hyperbole with its brilliance. Redefines the...oh, never mind. Trust us, it's just brilliant.